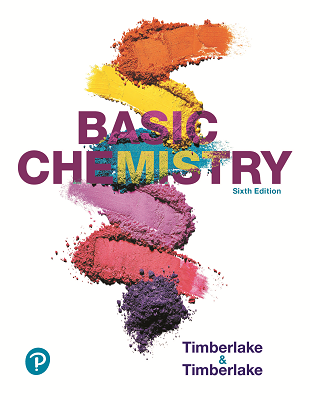 Basic Chemistry introduces students to the essential scientific and mathematical concepts of chemistry while providing the scaffolded support they need. The text uses accessible language and a moderate pace to provide an easy-to-follow approach for students. 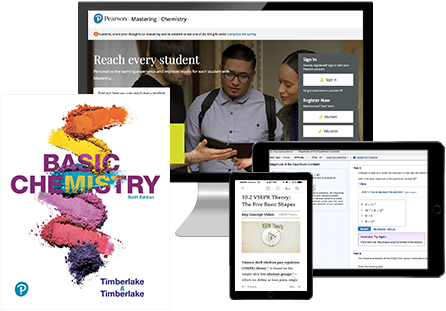 With Basic Chemistry, Bill and Karen Timberlake make the study of chemistry an engaging and positive experience for today’s students by relating the structure and behavior of matter to real life. The 6th Edition presents a new visual program that incorporates sound pedagogical principles from educational research on the way today’s students learn and retain knowledge. 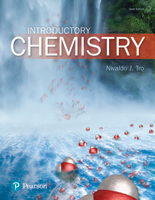 The text’s applied focus helps students connect chemistry with their interests and potential careers through applications tied to real-life topics in health, the environment, and medicine. The new edition strengthens its emphasis on problem solving with additional end-of-chapter Challenge problems and new assignable practice problems that ensure students master the basic quantitative skills and conceptual understanding needed to succeed in this course and to continue their studies in the field.